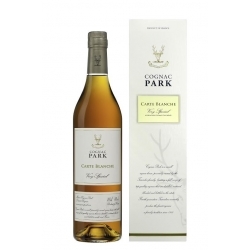 Cognac Park VS highlights the remarkably unadulterated style typical of cognac Park while providing a satisfying and enjoyable tasting experience. Hand crafted in small batches, the result of an attentive production process results in a young cognac of exceptional quality. One first encounters the combined aromas of dried spring flowers, caramelized apples, and macerated cherries opening up into a structured yet delicate palate, resulting in a perfectly robust and subtly peered aftertaste.